The Good Lady is a positive card. The card the good lady actually is positive. She provides a supportive and helping aspect. She is maybe your mother, an older friend or one of your neighbours. 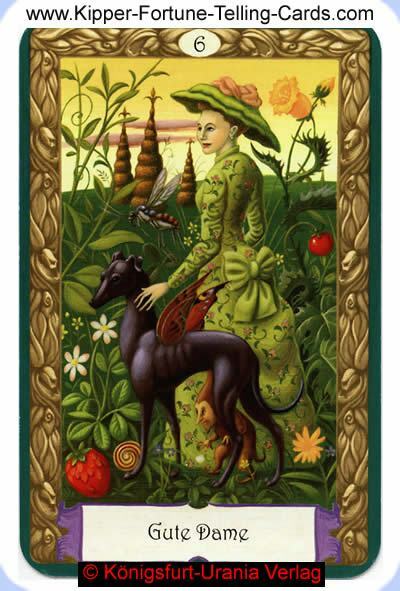 The surrounding cards shows the surrounding area, from which this woman comes and what connection she has with you. In a lesbian relationship, she represents the partner of the main character female. In a relationship it can be the divorced wife. But also even a advisor or patroness. Today, an elder lady will help you with a problem, which you can not solve alone easily. She is maybe your mother or from your neighbourhood. The card good Lady is positive so the answer will be yes. Without a doubt! A good lady, maybe a friend of you, who is a little elder then you, will help you to reach your goal.